The One and Only Willa Bean by Cecilia Galante. A Little Wings Book. Review: Picture this, a girl with crazy hair, her best friend Harper, and has a pet owl- all in a realistic fiction book. Does that sound like a book you would want to read? Keep reading to get a better vision of her. The One and Only Willa Bean, the 4th book of the Little Wings series written by Cecilia Galante and illustrated by Kristi Valiant is a book young children would enjoy as they follow the fun events in Willa Bean's life. One of Willa Bean's favorite phrases to say is, "Nope, nope, nope-ity, nope," she says that instead of just saying no which helps her show her fun character. She is a cupid; all cupids get a flying friend who comes from Earth. Willa Bean has a pet owl named Snooze. Snooze is a pygmy owl that came from France so he speaks some French along with good English. Willa Bean finds out that there is a new girl, Lucy, in her class. She brings her flying friend to school and it turns out that Lucy has a long-eared owl. Willa Bean thinks 'onlies' are the best and she doesn't like it when there is another owl in the classroom. Willa Bean tries to focus on Nobel Nimbus Day but she can't so she just focus on the present and is excited for Nobel Nimbus Day but something happens that changes everything and that is what you will find out if you read the book. In The One and Only Willa Bean, each chapter ends in the perfect spot to make the readers come back and finish the book. It is also stunning how she made things in the book seem bigger or smaller. For example, Willa Bean's owl is smaller than Raymond's lighting bug when in real life that isn't true. It makes the text better and creates more problems that make Willa Bean's character becomes stronger at over coming obstacles that get in her way. 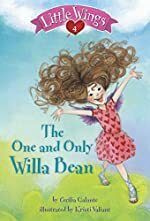 The One and Only Willa Bean is enjoyable for any age, early chapter readers, particularly girls will like this book because the characters are all cupids. Boys you may not be as interested, with the main character girl cupid. Lastly all of the characters are well developed and has a strong plot. Overall this book is very well written and good for younger readers who love realistic fiction. We would like to thank Random House for providing a copy of The One and Only Willa Bean for this review. Have you read The One and Only Willa Bean? How would you rate it?